An article from the Lancashire Daily Post of 18 May, 1943. 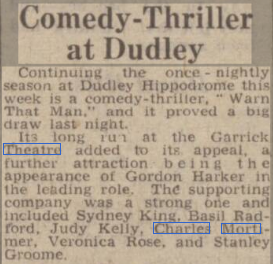 Charles Mortimer played a fifth columnist in this play, which also played the Hippodrome, Coventry, in March, 1943. Walsall Observer and South Staffordshire Chronicle 8 May, 1943. Owen Nares and his company have delighted large audiences at the Dudley Hippodrome this week, where they inaugurated the once-nightly season of London plays, commencing at seven o'clock, with matinees on Wednesday and Thursday. Next week the attraction will be the comedy thriller, "Warn That Man", by Vernon Sylvaine. It comes to Dudley after a year's run at the Garrick Theatre, London. and is a co-starring vehicle for such internationally famous stage and screen artists as Gordon Harker, Basil Radford and Judy Kelly. Prominent in a supporting company, which has been chosen with consummate skill, are Sydney Hing. Charles Mortimer. Veronica Rose and Stanley Groome. From the Birmingham Daily Gazette of 11 May, 1943. Continuing the once - nightly season at Dudley Hippodrome this week is a comedy-thriller, "Warn That Man.” and it proved a big draw last night. 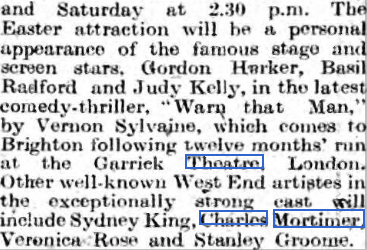 Its long run at the Garrick Theatre added to its appeal, a further attraction being the appearance of Gordon Harker in the leading role. The supporting company was a strong one and included Sydney King. Basil Radford, Judy Kelly, Charles Mortimer, Veronica Rose, and Stanley Groome. From the Coventry Standard of 27 March, 1943. The comedy genius Gordon Harker has an excellent opportunity for exploitation. "Warn That Man,” which is being presented this week at the Coventry Hippodrome, and he takes full advantage of it to give local audiences the delight of hearing and seeing and enjoying the rich humour for which he is famous. The play is packed with exciting incidents all the way through, and merely front the thriller aspect it would have great hold on an audience. 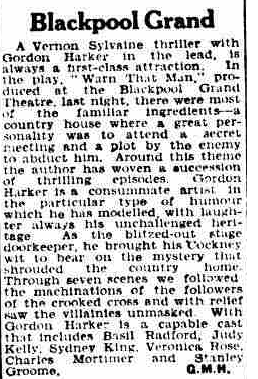 Gordon Harker is more than comedy relief; he becomes the central figure whose actions the whole plot depends. The fact that in the process of foiling a gang of Fifth Columnists, he raises laugh upon laugh does not spoil the story but rather raises it to greater entertainment. The whole of the cast is first-rate, and the play is produced in fine style. Mid Sussex Times - Wednesday 21 April 1943. The play was to be staged at the Theatre Royal, Brighton. From The Evening Despatch - Tuesday 11 May 1943. 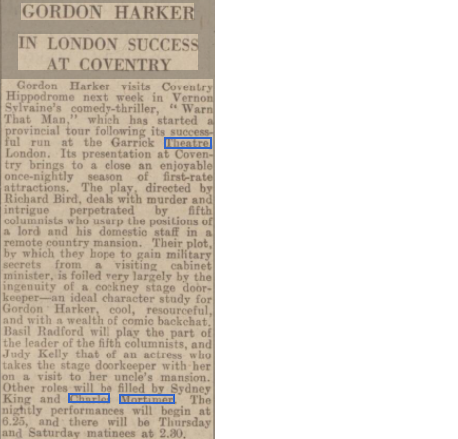 From The Coventry Evening Telegraph - Tuesday 23 March 1943. 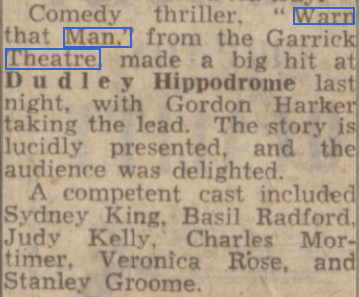 From The Birmingham Mail - Friday 19 March 1943.